I had a lot of hope for 2018 back in the January cold at my first WSR launch of the year. February was a nightmare from a weather standpoint, but things turned around by March. Unfortunately, igniter issues meant that I'd manage just eight flights over the course of three weekends. That seriously rained on my parade, but it also made me think about upgrading my igniters. Going on the advice of others, I melted a ping-pong ball in acetone, dipped the igniters in the mixture, then immediately dipped the igniters into black powder. Once dried they were ready to use, but by the time I had finished with the project, baseball/soccer/football seasons were in full swing, and the only time I found the field empty seemed to be when I was passing it on the way to something else I had planned. October is my month of choice for vacations. Flight plans for the first vacation didn't work out, but the second one delivered a perfect afternoon for flying, sunny and cool with minimal breeze. I loaded up and hit the field. I had a backlog of rockets that had never flown or hadn't flown in years. I had a bunch of new, improved igniters, and I had a dry, sunny day on an empty field. I was stoked. I call this "How I Roll". First off the pad would be my Semroc Javelin, which dates back to the early Carl days. Back then I was working nights and would keep a close eye on the Semroc site for new product, then buy multiples of the low number kits. I built this one and kept the lower numbered one. Number 9 resides downstairs, so this one would have been kit #10. This would be the first test of my new igniters. The Javelin would be loaded with and A8-3, which was plenty of motor for my ever shrinking field. I'd also bought a wildly expensive 9-volt battery for my favorite quest launcher, so something had to go right, right? Oh, yeah. I had my worn, but trusty Sony camera ready and pressed both buttons at the same time. The results were fantastic, and would remain so all day. The results were everything I'd hope for. Ignition was almost instant, and with the rod pointed straight up from left field, the flight had a gentle arc to it that carried it out toward center field. I'd forgotten to repack the chute, so recovery was via parawad, but I anticipated no issues, which shows what I know. The Javelin cracked a fin on impact with the dry grass at the edge of the infield. This is pretty much the standard flight for the Javelin. Easy fix. Next on the pad was the Estes Star Wars Mini Naboo Starfighter. I'll be honest, I bought this via Ebay on the cheap. My interest in Star Wars began and ended with the original back in 1977, but I wanted one of the R2D2 launch controllers and this was the easiest way to get one. Mission accomplished, but I was left with this rocket. Still, it was a rocket, so I needed to put it to use as intended. The A3-4T motor was a perfect choice for the calm conditions. The flight was high and curved gently toward right-center field. I think the kit came with a parachute, but I'm not the type who gives much thought to packing a chute in a BT-5, so nose-blow recovery was the name of that tune. The flight was perfect start to finish, and the Naboo Starfighter will be ready the next time I decide to pull it out. It probably shouldn't hold its breath, but it didn't embarrass itself. Sticking with the mini-theme, next up was the seldom flown Estes Mini Marz Lander. This kit was either bought from, or given to me by the Beer Skunk himself, Scott McCrate. He included a set of decals to turn it into a real Mini Mars Lander, but I've yet to begin the conversion. It's on my radar, but so is finishing the 1:1 Mars Lander that I bought at one of the NARCONs in 2005 or 2006. Actually, there's a lot on my radar, so that doesn't always mean much. For some unknown reason, I wimped out on the engine choice for this bird. Past flights show pretty good success with A10-3T motors, but I picked a 1/2A3-2T. My estimate for this flight was 100', and I know I felt fortunate that the camera recycled the launch pics quickly enough for me to capture the moment when the chute began to fill a mere 10' from the ground. A flight is a flight, but other than the fact that another igniter worked as hoped, this one was on the feh side of the ledger. I'm going to make a note to self to stick to A3 or A10s from this point on. This is my second Estes Flutter-By. The first was nicely finished in a silver and candy-apple red scheme and looked and flew great here at B6-4 Field. That is until I actually decided to load a B6-4 into it. Saw it leave the pad, heard the ejection charge fire, then nothing. Flutter-By #2 would exist on a steady diet of A8-3s, starting today. Here at B6-4 Field, even an A8-3 flight has its hazards. The flight was fairly high and straight, but the ejection charge had a wang to it. The two pieces separated, with the top heading for the infield and the bottom disappearing into the ether. The weighted nose cone was propelled into the infield dirt hard enough to leave a considerable crater and scratch up the cone. I walked the outfield looking for the bottom, but came up empty. What should have been an easy find was complicated by not knowing a general area to look and the fact that the grass had just been cut, and from center to right was littered with the remnants of a baseball that had been found by the mowers. Flight #5 would be one of my recent Ebay pickups, an "experienced" rocket that came in a lot several weeks back. I flew a few of them at my last club launch, but I'd earmarked a couple as B6-4 Field-worthy. As far as I've been able to determine, this is just a scratch build using a bunch of old MPC parts and a mystery nose cone. It needed a new shock cord, but other than that it was ready to fly. I named it the Hot Mess for obvious reasons. Not pretty, but it performed and photographed well. The A8-3 flight lifted off slowly and was fairly low level, 200-250", but provided me with my first perfect parachute of the day, drifting slowly down into center field. A fairly nondescript flight, but after the next two flights, it would look like Apollo 11. Another Ebay refugee, the Cutlass was another home-brew bird that came to me in a lot several years ago. It flew once just after I got it, but recently turned up on my "need to fly" list. The flight would be on an A8-3 and, as this is a minimum diameter bird, would be fairly high for conditions with a slight arc out toward center field. The ejection charge again sounded like an explosion, and the neighborhood dogs expressed their displeasure. My own displeasure would soon follow. Though loud, the ejection charge apparently didn't pack much umph as it didn't clear the streamer. The Cutlass fell straight and fast to the left-center field grass, shortening itself by an inch or so. Apparently what feels like a secure masking tape job isn't always that. I have no idea where the casing went, but it should be mostly gone by spring. I've had the Quest Super Cruiser in a half-finished state for quite a while now, so I decided to load it with an A8-3 and give it a shake down flight before I figured out the decal situation. (The stickers that came with it didn't come with anything remotely resembling stick.) That's not so pressing an issue at this point. As is my custom, I pressed the camera and launcher at the same time, which usually nets me a pretty decent liftoff shot with this camera. Instead I got ten images virtually identical to this one. It finally took off as the camera began to recycle. Chances are if I'd gotten a liftoff shot it would have been sideways as the SC began skywriting immediately upon clearing the rod. The ejection charge actually fired while it was on the ground. Undamaged, but I can't say that the idea of flying this one again has much appeal. As the legend goes, the reason my first rocket was an Estes Beta was that my neighbor beat me to JC Penney Toyland that day in 1977 and picked the Rogue first. That's actually how it happened, and 24 years later the Rogue became one of the first rockets I cloned, albeit in BT-55 size. Not long after I discovered BMS and picked up a nose cone to make my own 1:1 clone. For some reason, it hadn't flown since 2004, so I righted that wrong on this day. Everything was back to normal with this flight. I got a good liftoff shot and the 1/2A3-4T was plenty of motor for conditions. Not wanting a repeat of the Cutlass issue I decided against a streamer for this flight and went with nose blow recovery. That would not have been an issue if it hadn't landed on the infield. As it was, I'm dealing with a loosened fin. Not a big deal. Another Ebay bird was next on the pad. This one was in the same lot as the earlier Cutlass and got tagged the Fury. (I may have been car influenced on that day.) The Fury appeared to be of the Vector V school of design, but that nose cone has me puzzled. Still, it was the best of the lot it arrived with, but hadn't flown since 2015. This flight would be on an A8-3, the standard of the day. No worries about parachute issues with this one. That BT-50 main tube is perfect for a 12" Semroc chute, and I just happened to have one that was doing a lot of work on this day. Everything about this flight impressed. Decent altitude, perfect recovery, and to top it all off I found the bottom half of the Flutter-By from five flights earlier. Can't beat that. The IQSY Tomahawk would be my second Semroc bird of the day, but unlike the Javelin, it had never previously flown. It's also been sitting half painted since last winter, but still looked pretty good on the pad. As with most on the day, this would be an A8-3 flight. All traces of a breeze had disappeared by the time this flight occurred, so the arrow straight flight was no surprise. Ejection occurred just as the rocket began to tip and sounded like a normal ejection charge. Drift was minimal, and the Tomahawk landed just a few feet away from where the Javelin had landed earlier. It's since been masked and is waiting for paint. Flight #11 would be the MRI Theta 37 that I had cloned over the winter. Back in the dark and cold days I had printed off the plans at YORP http://www.oldrocketplans.com/mri/mri3-7207/mri3-7207.htm, then figured out a parts order from eRockets. I was in the midst of my "anything but white" painting period and chose the blue and gold look after seeing how well the colors went together on another rocket. The first flight had been an amusing one in the WSR cornfield. The Theta 37 had been one of the rockets that I'd taken along to B6-4 Field in March when I was in the midst of ignition issues. At the time I was building it, I was also in the midst of a simple glider frenzy, and had found out by experience that an A8-3 was too much motor for them on my little patch of grass. So, while I was loading the builds from winter with A8-3s, I was also loading the gliders with 1/2A6-2s. Inevitably one got mixed up, and with the whole club watching in the expansive cornfield, my Theta 37 barely scraped to 100' on the 1/2A. DOH! I'd done my prep the night before, but made sure I didn't mix any motors. (Mostly because I was out of 1/2A6-2s.) The Theta 37 would finally get an A8-3 flight on a field meant for A8-3 flights. The flight was quick off the pad and topped out around 300', but the streamer only partially deployed and it was on the ground before the camera was ready to shoot again. No damage, but it might be worth thinking about going with a thinner streamer than the caution tape one that is currently in it. The final flight of my Ebay birds on the day would be one I called the Warlock, a creation that seems to have build on the SPEV ethic using leftover parts from other projects. It originally came with only a single BNC-20R in one of the pods. Since I can use that on another project, I replaced it with two temporary cones scavenged from my big Taurus rebuild. The first legitimate B6-4 flight of the day, the Warlock is big and bulky enough to fly this field on a B motor. The flight itself was as expected, a slight arc to 300' with ejection just after it tipped over. At ejection the shock cord tangled in the pods, which didn't allow the chute to completely deploy. The effect was like a big streamer and the rocket landed hard on one of the fin assemblies, which popped off as feared. Damage is minimal. Next time out I believe it gets a bigger chute and possibly a B6-2. The next flight would be the Estes Patriot I cloned specifically for B6-4 Field flights. I'd previously done a Patriot with a 24mm motor mount, but while that kind of power was good for cornfields, it was a bit much for the tree-lined confines closer to home. An 18mm motor, though, was perfect. As the flights went on the day, I'd have to call this one the best from start to finish. I got a great launch shot out of the B6-4 flight, and an impressive one under canopy as well. Altitude was around the 300' mark with deployment at apogee and a slow drift to deep short, surprisingly slow considering the huge hole cut in the 18" chute. Before it landed, I realized that the recovery path was going to take it between me and the flag that flies between the fields. It would have been nice if the breeze was blowing just a bit more to get the flag flapping a little, but it's likely I wouldn't have even gotten this shot with more breeze to contend with. Shot of the day. Even the landing was perfect. Missed the infield by about six feet. That string of luck wouldn't last. This was the second flight of the Long John Silver, a 1973-ish offering from the Estes Model Rocket News series of plans. It came about during my winter of "Let's build something no one ever brings to the pad" in 2017-18. Another BT-5 rocket, it did nothing to convince me that I have no business trying to build and fly rockets with such tiny tolerances. The flight was perfect, the ejection charge robust, and the motor casing gone, despite enough tape to change the center of gravity. The nose cone managed to get out, but just barely. Like the first flight in the Ohio corn in early 2018, the LJS fell to earth nose first and impacted the ground fairly hard. Unlike the early flight, this landing wasn't in soft dirt and didn't wind up causing minor damage. Long John it ain't. I'll give it one last try before I repurpose the nose cone for something decorative. This could actually have been my last flight on the day, and almost was. I picked this original Centuri Vector V up in an Ebay auction a couple of years back. It was open, missing its parachute and with a water damaged decal, but how often to you get to experience actual Centuri fret buzz in this day and age. I planned to build and fly it from the start. It's been flightworthy for months, but I haven't been able to make myself put paint on the original tubes, cone and fiber fins. It just looks too cool as is. The flight was on an A8-3, and it was about as perfect as one could ask from a collection of old parts. It flew to about 250', ejected just as it tipped over, and rode the Semroc chute down to a soft landing in the outfield grass. The fact that my two best flights on the day were turned in by classic designs was not lost on me. I had 18 rockets prepped for this visit to B6-4 Field, and the Vector V was flight #15 on the day. 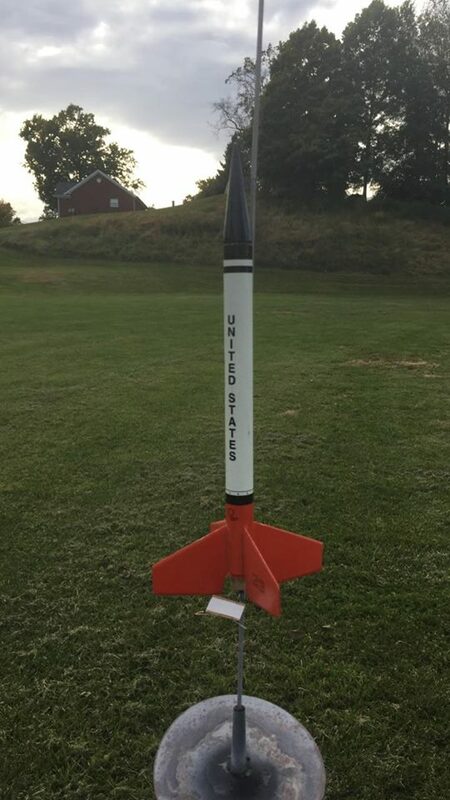 Two of the rockets I brought had unseen issues that would prevent them from taking part in the flights on the day, and both were launch lug related. Both were old Ebay rescue birds, one from 2001, the other from 2018. The 2001 bird was an ancient Estes Honest John that had a launch lug fall off as I was loading it onto the rod. The other was an Estes A.S.P. that I bought a few weeks back, but never noticed that it had been built without a launch lug. That left an MRI Lambda 8 as the only flyable rocket left in my tote, and with the sun now all but gone from the sky, it's quite possible that the Vector V would have been the last flight of the day. As I was walking back from recovering the V, a dad in the parking lot across the street told his daughter that I was about to launch a rocket, and they walked to the rail to watch. Not one to refuse a command performance, I loaded the Lambda 8 for what would now be the final flight of the day. This ignition picture gives a good idea of what I was seeing most of the day with the improved igniters. Ignition was almost instantaneous with 15 of the 16 flights, with a lot of sparks showing. I have always been careful to take as much of the leftovers from my days of flight with me when I leave. Leaving the occasional engine casing is unavoidable, but the wires and paper from the igniters and the used motor plugs always go into a bag that I bring along for later disposal. I usually have one or two plugs that I can't find. This time I found one. I saw a bunch rebound off of the blast deflector and head for parts unknown. Extra kick from the black powder on the igniters? Seems reasonable. Whatever the case, the igniters work this way. Interesting day. The hopped-up igniters proved to be a worthwhile project with a 100% success rating compared with 33% on previous 2018 launches. My flight stats at rocketreviews.com told me that I not only flew my 1500th flight, the Estes Patriot being the bird that got the honor, but also that my 1149 Ns on only 97 flights is second only to 2013, when I had 1528 Ns on 160 flights. My average is up, but with only two months to go I might be a little behind on setting any records. Rocketry stats. Can it get any cooler? The Re-Rebirth of the Star Trek Starter Set Rocket Upscale- Finale! I've been at this for almost fifteen years in BAR guise after starting in 1977. Who ever thought that other adults would share my fascination?